The 8051 microcontroller has two independent 16 bit up counting timers named Timer 0 and Timer 1 and this article is about generating time delays using the 8051 timers. Generating delay using pure software loops have been already discussed here but such delays are poor in accuracy and cannot be used in sensitive applications. Delay using timer is the most accurate and surely the best method. A timer can be generalized as a multi-bit counter which increments/decrements itself on receiving a clock signal and produces an interrupt signal up on roll over. When the counter is running on the processor’s clock , it is called a “Timer”, which counts a predefined number of processor clock pulses and generates a programmable delay. When the counter is running on an external clock source (may be a periodic or aperiodic external signal) it is called a “Counter” itself and it can be used for counting external events. In 8051, the oscillator output is divided by 12 using a divide by 12 network and then fed to the Timer as the clock signal. That means for an 8051 running at 12MHz, the timer clock input will be 1MHz. That means the the timer advances once in every 1uS and the maximum time delay possible using a single 8051 timer is ( 2^16) x (1µS) = 65536µS. Delays longer than this can be implemented by writing up a basic delay program using timer and then looping it for a required number of time. We will see all these in detail in next sections of this article. Designing a delay program using 8051 timers. While designing delay programs in 8051, calculating the initial value that has to be loaded inot TH and TL registers forms a very important thing. Let us see how it is done. Assume the processor is clocked by a 12MHz crystal. That means, the timer clock input will be 12MHz/12 = 1MHz That means, the time taken for the timer to make one increment = 1/1MHz = 1uS For a time delay of “X” uS the timer has to make “X” increments. 2^16 = 65536 is the maximim number of counts possible for a 16 bit timer. Let TH be the value value that has to be loaded to TH registed and TL be the value that has to be loaded to TL register. Then, THTL = Hexadecimal equivalent of (65536-X) where (65536-X) is considered in decimal. Program for generating 1mS delay using 8051 timer. The program shown below can be used for generating 1mS delay and it is written as a subroutine so that you can call it anywhere in the program. Also you can put this in a loop for creating longer time delays (multiples of 1mS). Here Timer 0 of 8051 is used and it is operating in MODE1 (16 bit timer). The above delay routine can be looped twice in order to get a 2mS delay and it is shown in the program below. Few points to remember while using timers. Once timer flag (TF) is set, the programmer must clear it before it can be set again. The timer does not stop after the timer flag is set. The programmer must clear the TR bit in order to stop the timer. Once the timer overflows, the programmer must reload the initial start values to the TH and TL registers to begin counting up from. We can configure the desired timer to create an interrupt when the TF flag is set. If interrupt is not used, then we have to check the timer flag (TF) is set using some conditional branching instruction. Maximum delay possible using a single 8051 timer is 65536µS and minimum is 1µS provided that you are using a 12MHz crystal for clocking the microcontroller. 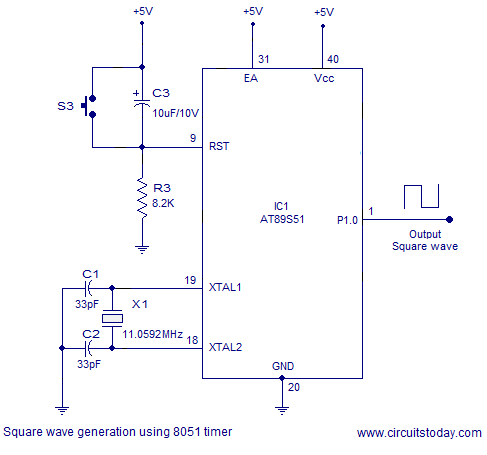 Square wave generation using 8051 timer. Square waves of any frequency (limited by the controller specifications) can be generated using the 8051 timer. The technique is very simple. Write up a delay subroutine with delay equal to half the time period of the square wave. Make any port pin high and call the delay subroutine. After the delay subroutine is finished, make the corresponding port pin low and call the delay subroutine gain. After the subroutine is finished , repeat the cycle again. The result will be a square wave of the desired frequency at the selected port pin. The circuit diagram is shown below and it can be used for any square wave, but the program has to be accordingly. Programs for different square waves are shown below the circuit diagram. 1KHz Square wave using 8051 timer. 2 KHz Square wave using 8051 timer. 10 KHz square wave using 8051 timer.